Its been far too long since my last post. There is so much to update and do, I sometimes fall short on the very thing I hammer into my web clients: BLOG. So the intentions is catch up within the next few months. With that being said lets start with a recent and fun art project. I love being able to combine a reason to create with a charitable cause so when I can- I offer some work, volunteer, or create new work specifically for some great causes. To see some of groups I worked with click here. 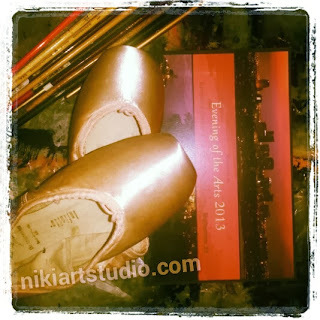 Last month, on a random visit to another artist's studio I came across a project I had to participate in. 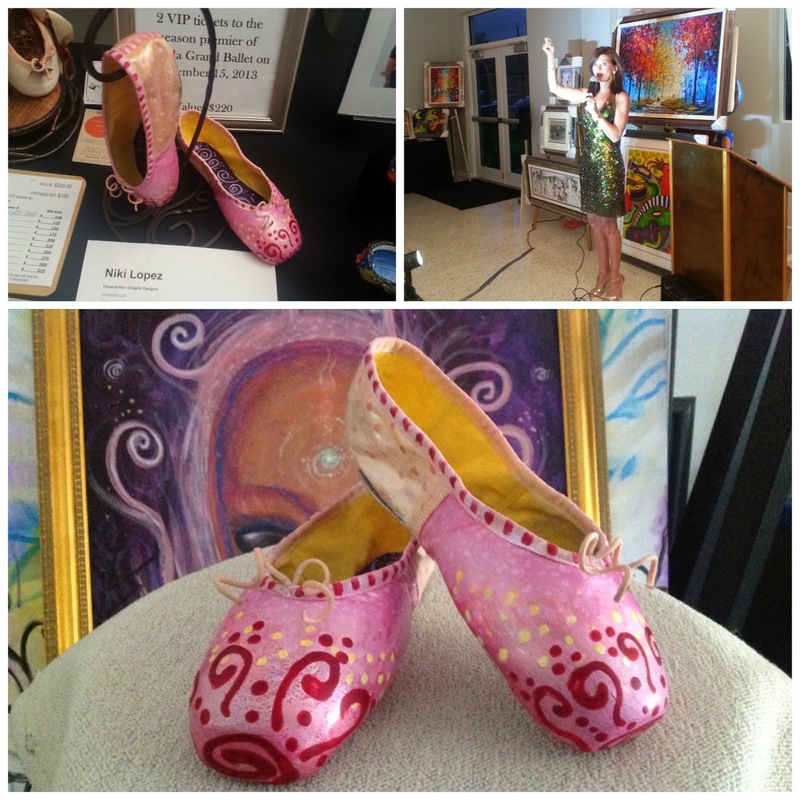 A local performance school Muse Center for the Arts had used pointe ballet shoes that they needed artists to paint as a part of their big fundraiser night. 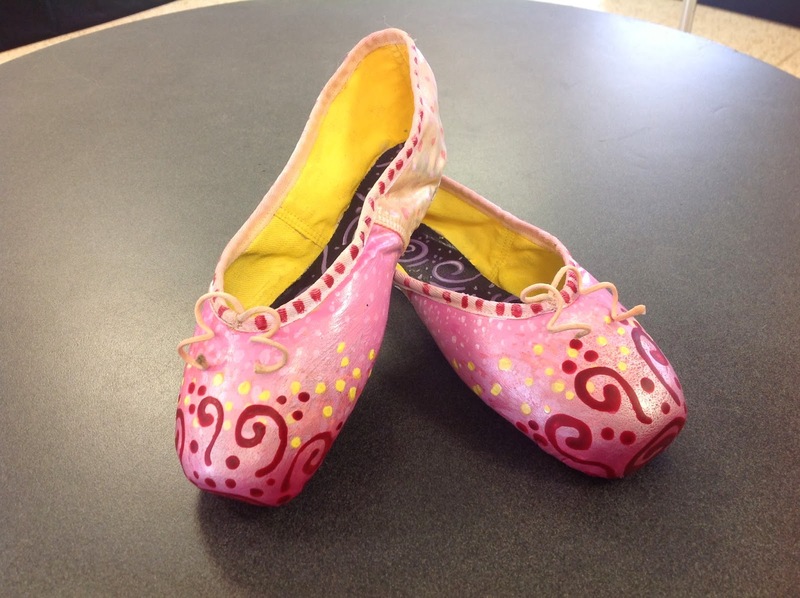 Being an old ballet buff and a former art teacher at the school, I jumped on the opportunity to decorate a pair. The Evening of the Arts 2013 was benefiting Children & the Arts in Broward County through The BRAVO Foundation for the Arts. 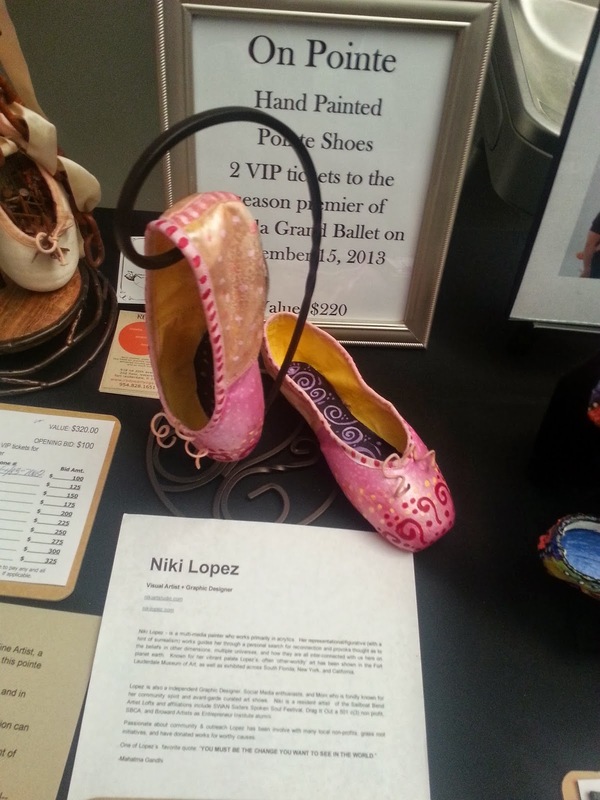 The night included many wearable art, prints and originals auctioned by Hamilton Fine Arts, find food by many local restaurants as well as performances, dance rehearsals, and monologues. 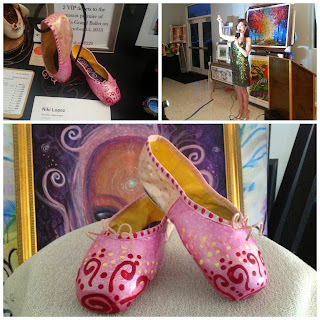 I really enjoyed painting the slippers and played around with different colors and textures. Instead of priming the slippers which would have made the entire shoe stiff and wanting to keep some of the original fabric and movement - I used many layers of fabric stiffener on the front part of the show, and left the original fabric showing through on the back of the slippers. I also painted the inside a playful bright color and used contrasting swirl patterns on the inside. 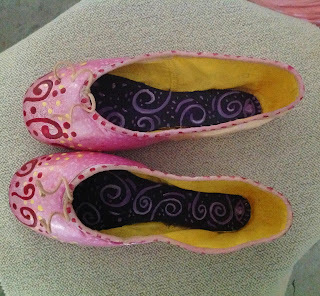 Finally I wrapped and the strings on the front of the slippers to a whimsical curl. 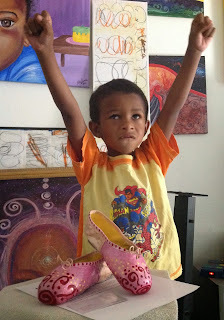 Below are some shots of the painted slipper along with my trusty side kick Marley who wanted to pose with the slippers. My 4 year old Marley posing next to painted pointe ballet shoes. I'm happy to report, my slippers was one of the ones sold at the silent auctioned and a personal highlight was when one of the ballet dancers said she would love to dance in my slippers.